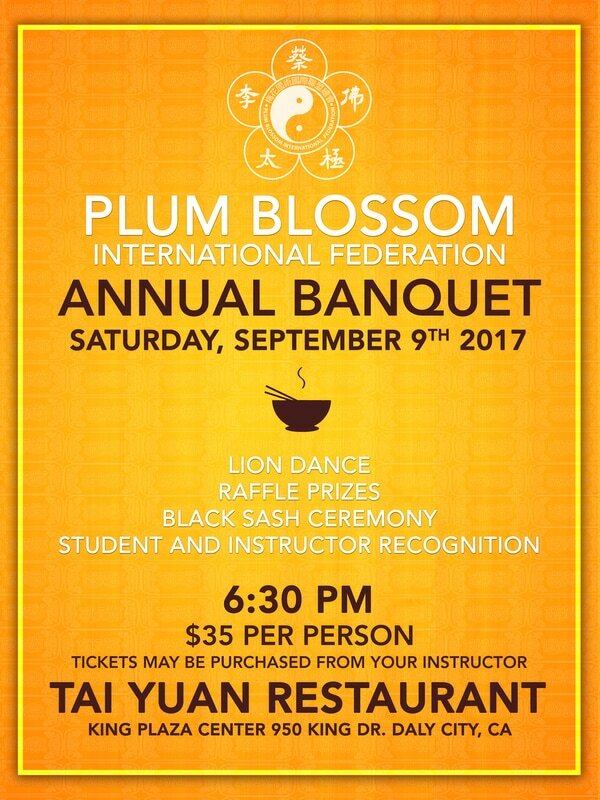 Join us Saturday, September 9th 2017 for our annual Plum Blossom International Federation banquet at Tai Yuan Restaurant in Daly City, California. Dine with Grandmaster Doc-Fai Wong, Tai Sifu Jason Wong and many instructors and students from all around the world. There will be an opening lion dance followed by a multiple course meal (vegetarian courses as well) along with a raffle with a special grand prize and student and instructor recognition. Tickets are $35 per person and tickets can be purchased from your instructor. It is a special night of making friends and sharing memories, we hope to see you there!